Different weddings may use the same venue, wedding planner, or catering company, but no two weddings are exactly alike. It’s the finishing touches; the centerpieces, decor, favors, tables and guestbook, that really make each wedding personal and unique for each couple. As 2017 is now among us, we look forward to seeing the originality and creativity from the brides of this new year! Prepare to be inspired! Whether you and your fiancé love to travel, read, dance, cook or experience new things together, we have a plethora of perfectly unique ideas for you. With some of our favorite vendors from WeddingChicks and Etsy, you can create an unforgettable day for you and your guests. 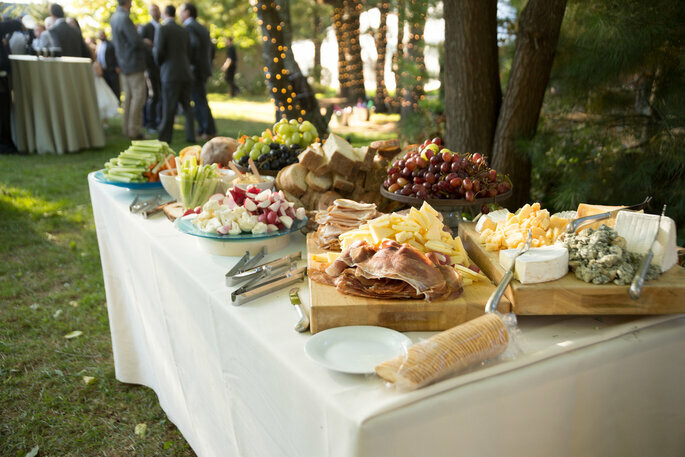 Are you the kind of couple that already had your caterer picked out before confirming your wedding venue? Perhaps you have dreamed about your ideal wedding menu for quite some time now, discussed flavor combinations with your significant other, and even created an inspirational food board on Pinterest. If this is you, then here are some innovative ways to personalize your wedding according to your passion for gastronomy. Consider naming each table after one of your favorite dishes, cuisines, restaurants, drinks or cocktails. Have sweet tables, cheese tables, and canapés that you want each one of your guests to experience. Everything down to the champagne can be personalized yet still tasty. For example, a DIY “pimp my prosecco” table, with pick’n’mix fruit, will surely excite your guests! 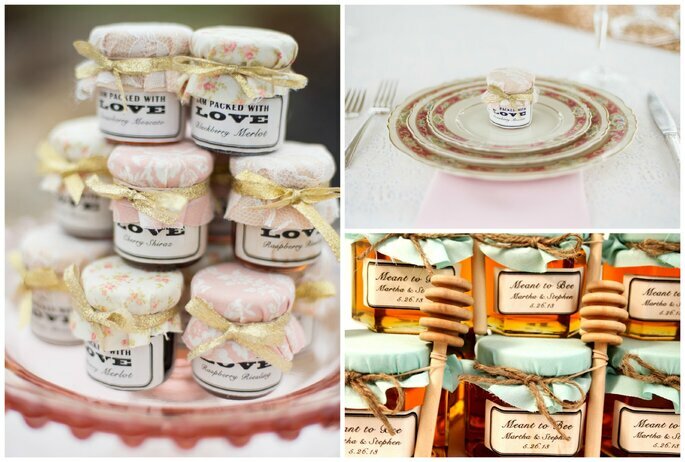 In regards to wedding favors, you can be as creative as you like. Personalized bottles of chilli oil with authentic and quirky labels will really spice things up. Or, for something a little sweeter, check out these cute and personalized jars of honey and jam from Custom Love Gifts. Now let’s consider the couple with a passion for gardening, botanics, herbs and the beauty of nature. Perhaps you want to have an eco-friendly wedding, while still incorporating a rustic-chic theme. There are an abundance of creative elements you can incorporate into your wedding that allows for nature to be the main focal point of your table decór. Your centerpieces can be colorful, blooming, green and fresh. If you have an artistically brilliant florist, then there’s no limit to your creativity! We’re currently loving the 2017 cactus trend. For a twist on displaying your table numbers, consider placing potted plants on the tables, with the names or table numbers inserted into the pots. This will brighten up your table decor and can double as a decorative piece and wedding favor! Wedding Favors Unlimited boast about garden and nature-related decorative objects for your tables. For authentic or quirky labels that you can add to watering cans or potted plants, just look at Sixpence Paperie. When it comes to favors for the guests, what could be more personal than customized packets of seeds so that every guest can grow your favorite flower? It’s the perfect momentum of a perfect day. 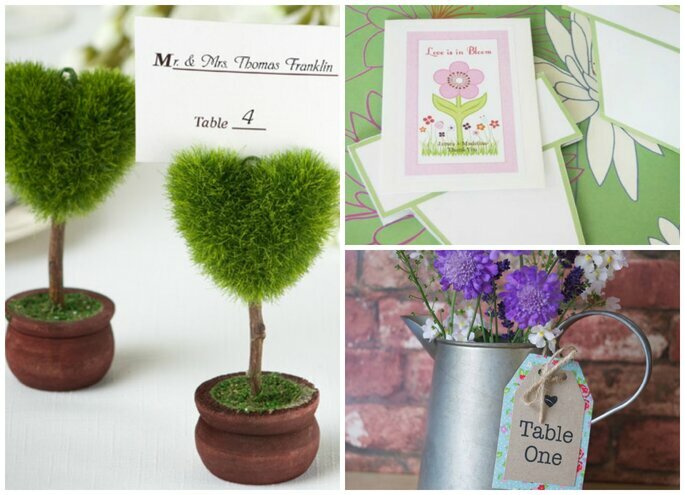 You can get various packet designs from Wedding Favorites, they offer flower-pot card stands with these green and eco-friendly gifts. Literature is a romantic, exciting, charming and enchanting form of art. So if you and your partner share this passion, then just think of the decorative potential that comes with it! Name each table after one of your favorite quotes, romantic lines, poems, writers, plays or novels. The children’s table can replicate your own childhood fairytale favorite. You could also think of amorous pairings in classic texts; Romeo and Juliet, Gatsby and Daisy, or Elizabeth Bennet and Mr. Darcy. Our top pick of ideas are pictured below. “We are all in the gutter, but some of us are looking at the stars.” Imagine having star-shapped confetti printed with an Oscar Wilde quote! You can order these and other literature inspired extras from Nabu. You can also find prints of your favorite quotes in romantic frames from, TicketyBoo Prints. These little details would look great on tables or adorned around the venue. 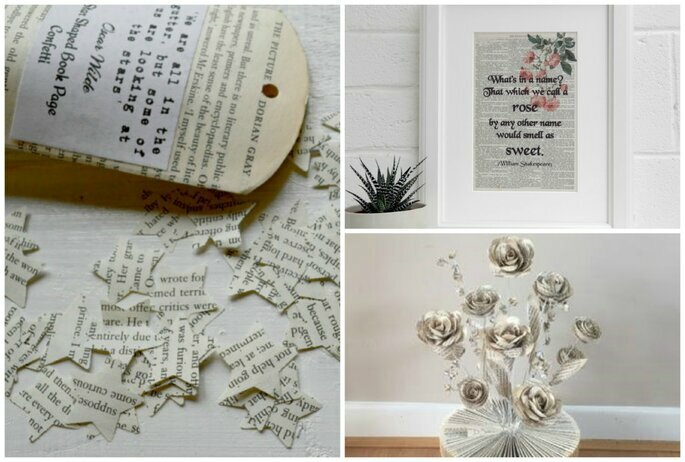 Or, if you would like to place then on your wedding tables, check out the inspiring work from Danielle Sullivan: she crafts roses from works of literature! The wanderlust couple are a popular breed. Their mutual goal, apart from having a healthy relationship, is to see the world together. In most relationships, memories of holiday vacations are often the most cherished. There’s just something really romantic about sharing new experiences, cultures, climates and food with the person you love. So, aside from the idea of naming every table after your favorite places, here’s what else to look for when planning a wedding around your memories abroad. If you have traveled, then a map of the world is considered as a special accomplishment between your spouse and you. It’s exciting being able to mark off each place you have visited, little by little. 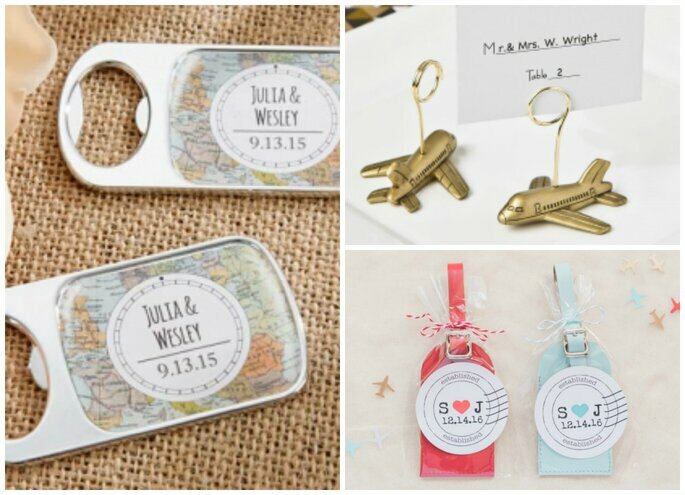 Wedding Favors Unlimited has a whole section on their website dedicated to the theme of travel, and we love their customized keepsakes. Check out their silver map bottle openers which can be personalized with your names. Perhaps tie them to wine bottles or to everyone’s glass for a lovely surprise! Also pictured below are their airplane place card holders, a perfect addition to any table. For destination weddings, consider giving every guest a customized luggage tag from Love Travels Favors. Not only is it a practical favor they can use, but whenever they travel they will think back to the fond memories of when they attended your wedding! You could have met at a festival, you could be musicians, or you simply both share a love for a certain type of music. Either way, let everyone know through your wedding decorations! 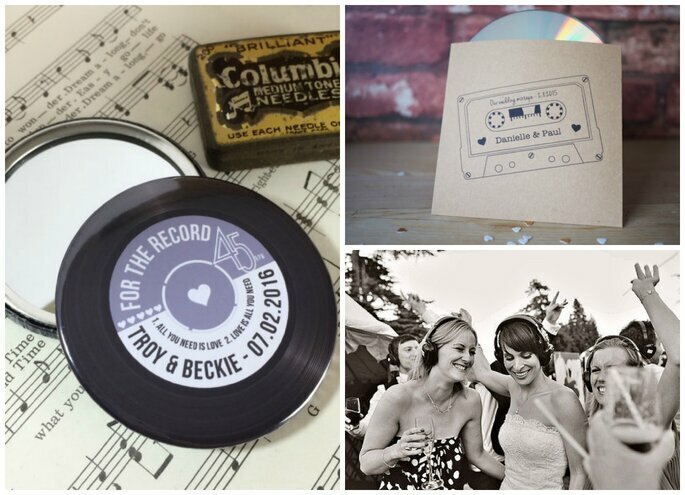 Your wedding playlist will say a lot about you, so create some very personal CD covers with Sixpence Paperie and have everyone take home the sound of your wedding! Alternatively, you can customize music-themed compact mirrors for your female guests with the help of Love Me Do Design! If you and your fiancé don’t necessarily share a particular hobby, but simply want to create a personal, extra special day, then photos make incredible decorations. Whether they are replacing table numbers or featured as memories around the room, they help to make your wedding truly unique to you. Our favorite photo-related idea is leaving disposable cameras on all the tables for your guests. This way, you will be able to get photos developed that are more spontaneous and funny than those taken by your photographer. 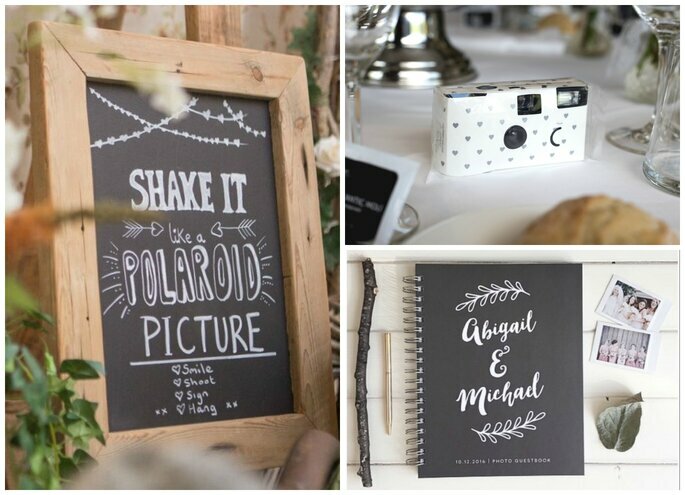 Invest in a polaroid camera and have your guests insert photos in a guestbook, for a a lovely and artistic reminder of who came, and what they had to say. We love this hand made sign by Unique Designs, and when paired with a chic, personalized guestbook from Print Smitten, you can provide your guests with some fun activities to do during the reception. If your goal is to create uniquely different wedding decorations, then we hope this article has inspired you! Whatever type of couple you may consider yourself to be, there is always a way to add creative flare to the final touches to your wedding while staying true to your style! To discover the top deco trends for 2019, head to our Youtube channel!